Researchers in Dania Beach, Fla., landed almost $1.2 million in a federal grant to continue working on an underwater turbine prototype that will use ocean currents to generate power. 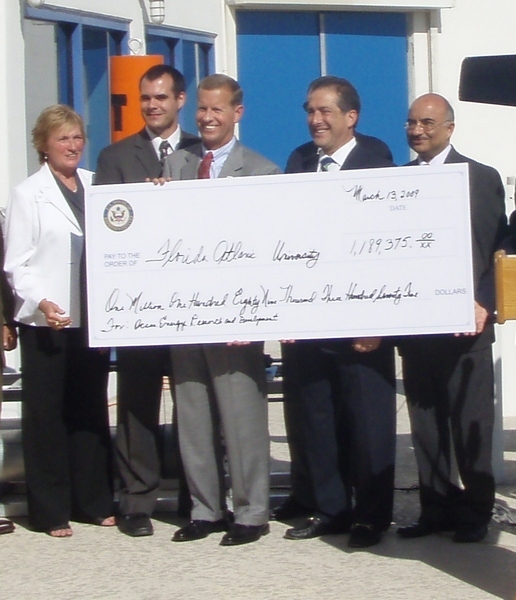 Researchers at Florida Atlantic University’s (FAU) Center for Ocean Energy Technology (COET) joined Rep. Ron Klein, D-Fla., today to announced the funding at the SeaTech campus in Dania Beach. The grant is part of the $410 billion spending bill signed by President Barack Obama. This is the first time the project has received federal funds. The money will help pay for testing and possibly expanding the staff as the Center moves toward making the turbines a commercial product that can be used in offshore areas around the country. Scientists and engineers say these underwater turbines can power buildings along the coastline and eventually become a major energy source. All the testing to date has been on land while the FAU Center studies underwater conditions and seeks federal and state permits to put the first prototype in the water, possibly this summer. The Center expects to raise its national profile and get more funding for this and other renewable ocean energy projects, including ocean thermal energy (OTEC) and deep seawater cooling for air conditioning. “This [money] puts us on the radar screen at the federal level,” said Susan Skemp, executive director of the Center.